#2) Why should we trust the CDC's handling of Ebola when the agency can't even keep track of its anthrax, avian flu and smallpox samples? 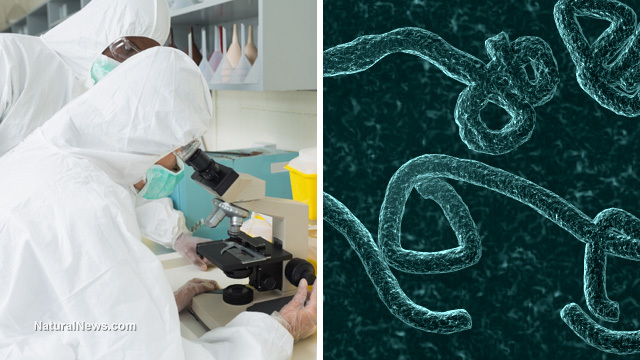 #5) If Ebola is "not a threat" to U.S. citizens as government authorities keep claiming, then why did the U.S. Department of Defense spend $140 million on an Ebola-related contract with the Tekmira company? ...diseases that are associated with fever and signs and symptoms of pneumonia or other respiratory illness, are capable of being transmitted from person to person, and that either are causing, or have the potential to cause, a pandemic, or, upon infection, are highly likely to cause mortality or serious morbidity if not properly controlled. #8) How can we trust a government to tell us the truth about Ebola when that same government repeatedly lies about Swine Flu, influenza, Fukushima radiation, weather control technology, the security of the border and seemingly everything else? #9) If U.S. doctors claim to be so incredibly careful around Ebola that the virus could not possibly escape from the containment rooms at Emory University, then how did the American doctors being treated there contract Ebola in the first place? Weren't they also being careful? #11) If Ebola is not spread through the air as some claim, then why do doctors who treat Ebola patients always wear masks? #13) If Ebola escapes from patients at Emory University and begins to infect the public, do you think we would ever be told the truth about it? Or instead, would the official story claim that "Ebola terrorists" let it loose? #14) WHO BENEFITS FROM AN EBOLA OUTBREAK in the USA? This is a key question to ask, and the answers are obvious: the CDC, vaccine manufacturers and pharma companies, and anyone in government who wants to declare a police state and start rounding people up for quarantine in a medical emergency. #15) We already know there are powerful people who openly promote population reduction (Bill Gates, Ted Turner, etc.) Is a staged Ebola outbreak possibly a deliberate population reduction plan by some group that doesn't value human life and wants to rapidly reduce the population? #19) Given that the U.S. government has already funded outrageous medical experiments on Americans and foreigners (see the NIH-funded Guatemalan medical experiments), why should we not believe the government is capable of deploying Ebola in bioweapons experiments in West Africa? #20) Given that many vaccines accidentally cause the disease they claim to prevent (due to weakened viruses still remaining active in a small number of vaccine vials), isn't it likely that Ebola vaccines might actually cause Ebola infections in some percentage of those receiving them? How can we trust any vaccines when vaccine manufacturers have been granted absolute legal immunity from faulty products or failures in quality control? #21) How can we trust a medical system that continues to put mercury in flu shots, refuses to recommend vitamin D to cancer patients and has been criminally corrupted to the point where drug companies are routinely charged with felony crimes for bribery and price fixing?